CLICK HERE to email for product information or a price request. CLICK HERE for RAM sizing guide and naming convention help. Price $194.99 + Free Shipping and Laptop Accessory! Select Free Laptop Accessory Below ! Free Laptop Accessory or Additional Discount! Substitute Included Tray With: No Substitution. I'll Keep the Standard RAM-234-3 Tough Tray. RAM-234-6 Select Netbooks & Tablets With Case [Subtract -$14.50] Contact Me - I Need Help Finding a Tablet Cradle. The RAM-316-3BA1U is the latest in the mobile in-car range from RAM Mount for light to medium weight electronic devices such as laptop mounts. No drilling required! Warranty: Manufacturer's, RAM Mounts (National Products Inc.), Limited Life Time Warranty. Base Description: Each aluminum leg has a mounting foot with a mounting hole. Simply place the holes into the passenger seat mounting bolts and adjust the mount to the required height with the flexible legs. The third flexible leg on the RAM Pod III should also be adjusted to help support the mount (normally up front under the dash on the passenger side). The rigid flexible arms will hold everything you need safely and securely. The latest in the Mobile In-Car range from RAM. Mounting Plate Description: Attached to the RAM-316-3BA1U is the RAM-101U assembly. 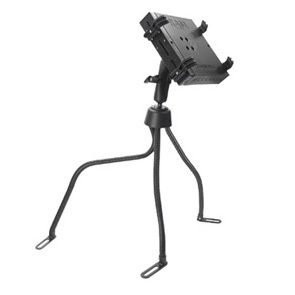 The RAM-101U is 7.35 inches in length when fully extended and articulates/pivots to any position. The RAM-101U includes the RAM-202U which is compatible with the AMPS hole pattern. For more detailed information click on the product link above. Tough Tray Included: The RAM-234-3 "Tough-Tray" will hold laptops with a width from 10 to 16 inches and also works with most 17 inch screen laptops. The tray includes four (4) side clamping arm with rubber grip feature. These arms can be moved both vertically and horizontally. This allows for a custom fit for varying thicknesses of laptops and the freedom of not blocking ports or drives. Hole patterns on perimeter of tray facilitate the mounting of additional RAM systems to support GPS, PDAs or other electronics. NOTE: To compare dimensions of the original Tough Tray and Tough Tray II click here. 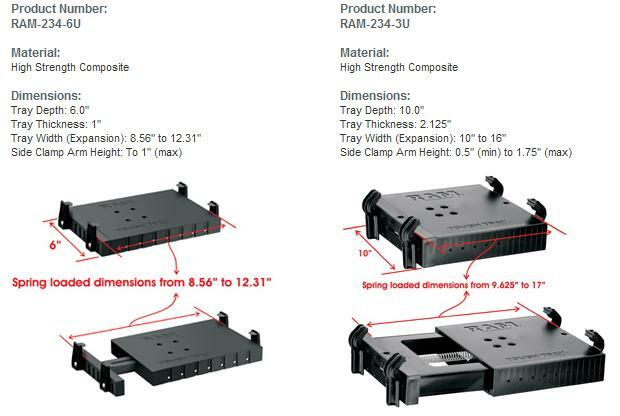 Tray Width (Expansion): 10 inches to 16 inches NOTE: Works with most 17 inch screens. Power Caddy: RAM-234-5U attaches to the back of the Tough Tray and holds power supplies and small accessories. Screen Support: RAM-234-S2U attaches to the side of the Tough Tray and secures the laptop lid in a fixed position. Secure-N-Motion: RAM-234-SNMU Secure-N-Motion is recommended by RAM Mounts if an electronic device is going to be secured in the the Tough Tray while the vehicle is in motion. .
Additional Accessories: To view additional Tough Tray accessories click here. At right angles to the base of two legs are feet with mounting holes. Simply place the holes into the passenger seat mounting bolts and adjust the mount to the required height with the flexible legs. The third flexible leg on the RAM Pod III should also be adjusted to help support the mount. The rigid flexible arms will hold everything you need safely and securely. Price $214.49 + Free Shipping and Laptop Accessory! Price $161.49 + Free Shipping and Laptop Accessory! Price $205.49 + Free Shipping and Laptop Accessory! Price $194.49 + Free Shipping and Laptop Accessory! Price $214.99 + Free Shipping and Laptop Accessory! Price $236.49 + Free Shipping and Laptop Accessory! Price $222.99 + Free Shipping and Laptop Accessory!